Obeah prosecutions were used very broadly, including against people whose healing work drew on European traditions such as mesmerism. One such case took place in Port of Spain, Trinidad, in 1910, when a husband-and-wife team, Mary and Arthur Clement, were prosecuted for ‘obtaining money by false pretenses with intent to defraud by the practice of obeah’. Although both were prosecuted and convicted, the main healer was Mary, also known as ‘Madam Joe’ or ‘Ma Joe’. Their defense was that Mary was a mesmerist, not an obeah woman. The evidence from the case suggests that Arthur and Mary integrated mesmerism with other traditions including Catholicism and forms of healing with connections to Africa. 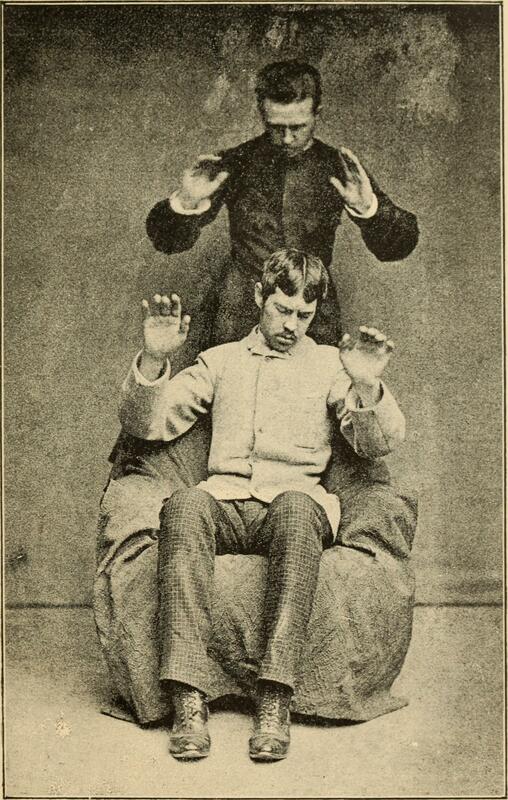 A late nineteenth century European mesmerist at work. From Gustav William Gessman, Magnetismus und Hypnotismus; eine Darstellung dieses Gebietes, mit besonderer Berücksichtigung der Beziehungen zwischen dem mineralischen Magnetismus, dem sogenannten thierischen Magnetismus und dem Hypnotismus (Magnetism and Hypnotism; A representation of this topic, with special reference to the relations between mineral magnetism, so-called animal magnetism, and hypnotism) 1895. Source: Wikimedia Commons. Mesmerism took its name from its inventor Franz Mesmer, who in the late eighteenth century developed the theory that a vital force, known as animal magnetism, ran through all living things. Health problems arose if this force was blocked. Mesmer believed that, like true magnetism, animal magnetism could work without direct physical touch. His ideas became fashionable in France and England in the eighteenth and nineteenth centuries, and spread to the Americas too. By the early twentieth century mesmerism was seen by the medical profession as a form of quackery, although many of its ideas and practices were eventually integrated into contemporary forms of hypnosis. The Clements were prosecuted after a man they had tried to heal, Mr Stewart, died. He had been sick for some time and had also been treated unsuccessfully in hospital. The Stewarts tried to find effective treatment from a range of healers, both official doctors and those using folk and religious healing techniques, like Mary Clement. This approach to treatment was common in the early twentieth century Caribbean. Annie Stewart also testified that Mary Clement, with her eyes closed, dictated to her husband a list of items to buy from a ‘drug shop’ (pharmacy). These were items that should be used in a ritual bath every day for six days. She also said that she had paid the Clements $5. Arthur Clement contested almost all of Annie Stewart’s account. His story was that his wife gazed at a candle held by Mr Stewart, deliberately inducing a hypnotic sleep. While in this trance state, Mr Stewart told her about her health problems, and she responded by telling him, still in a trance, the remedies that he could use. Six days later the Stewarts returned, and Ma Joe ‘slept’ again. Arthur also denied that the Stewarts had paid them $5. He said that his wife had received their standard charge of two shillings for her services as a mesmerist and as someone who gave ‘bush remedies’. In addition, he spoke of his own experience: Ma Joe had cured him after he had been sick for nearly four years and European trained doctors had been unable to cure him. It was after she healed him that he married her. Mary Clement did not give evidence at the trial, so we don’t have any access to her side of the story. While it is impossible to re-judge trials from a distance of more than a century, it seems likely that at least some of Annie Stewart’s account of a ritual involving rum and the blood of a fowl was accurate. We have no evidence that she had reason to lie, whereas Arthur knew that receiving money for conducting ritual acts for religious purposes (in this case, the removal of Spirits) was illegal. Mesmerism and Catholicism were safer, and legal. This does not mean that Arthur’s account was untrue. Probably Mary’s hypnotic trance and prescription for purchased ‘bush’ remedies to be used in a ritual bath did take place, but were integrated into a wider effort to heal, which also involved the ritual involving blood and rum. Other evidence in the case referred to the use Catholic symbols, such as a crucifix and a chaplet (a string of rosary beads), again suggesting the integration of multiple sources of healing and religion in the case. The Clements’ defense lawyer, Gaston Johnston, argued that the Clements merely made use of symbols of ‘their faith as Roman Catholics’. Ma Joe’s services seem to have been popular with many different types of people. In her defense, at least three people testified that she had successfully healed by them, including one man who said that he’d been ‘pronounced incurable by several doctors’ at the hospital after suffering a fractured skull. The Clements’ defense lawyer, Gaston Johnston, asked for other witnesses to be allowed to testify about Mary’s treatment of them in private (‘in camera’) because their ‘public positions’ meant that they did not want to do so in the public court, suggesting that they were of relatively high status. The magistrate refused to allow this, so we do not know who they were, but the fact that they were apparently prepared to give evidence hints at the breadth of social backgrounds from which Caribbean people made use of the services of those accused of being obeah workers. The magistrate rejected the defense arguments and convicted both Arthur and Mary. He sentenced Arthur to three months in prison and Mary to one. Alexander, Joseph. Recollections of a Trinidad Detective (Port of Spain, 1920). Paton, Diana. The Cultural Politics of Obeah: Religion, Colonialism and Modernity in the Caribbean World. Cambridge; New York: Cambridge University Press, 2015, p. 182.